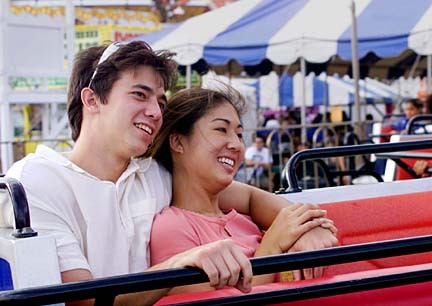 Kyle Sergent, left, and Stacey Arizumi rode the "Super Sizzler" yesterday at the Hawaii State Farm Fair on the grounds of Aloha Stadium. Admission today is 50 cents from noon to 6 p.m. with an empty Pepsi can. The fair continues next weekend, offering food, rides, performances and a country market. Volunteers from Kaiser Permanente were on hand yesterday to clean, paint and repair the Salvation Army's Kaimuki campus. 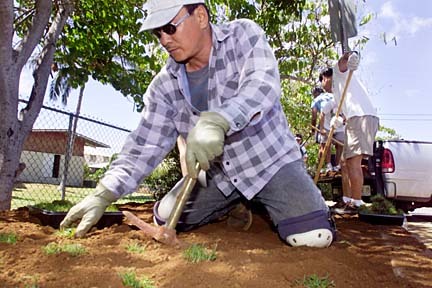 Liberato Laroza, a Salvation Army employee, worked alongside other volunteers to plant grass along the street. Helping Hands Hawaii held its second annual white elephant sale yesterday in Kalihi to benefit the Community Clearinghouse. 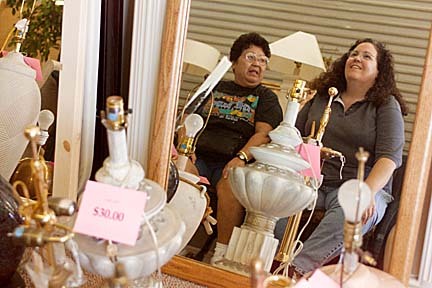 Volunteers Virgie Ortogero, left, and Tina Ortogero took a break, surrounded by items for sale.